Nearly 100,000 visitors were drawn to an exhibition of sacred art which recently concluded at the National Gallery in London. This was triple the number of visitors expected. According to Curator Xavier Bray, it was "the immediacy of the images" that drew such a large number of people. "The images of Christ were very truthful, profound depictions; you were meeting the Virgin, Christ and the saints in a very direct way." In a crowded gallery, he said, "there was a wonderful sense of silence - awe-inspired people. I met a Sufi woman in tears. 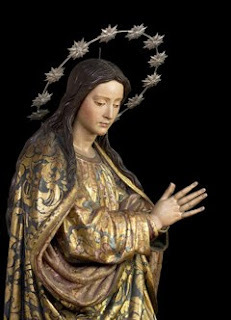 "The Sacred Made Real: Spanish Painting and Sculpture, 1600-1700, which will be housed at the National Gallery in Washington, DC from February 28th to May 31st, showcases major paintings by Diego Velázquez, Francisco de Zurbarán, and Francisco Pacheco, as well as painted and gilded sculptures by Gregorio Fernández, Juan Martínez Montañés, and Pedro de Mena, among others. Many of the sculptures have never before been exhibited away from their Spanish churches, convents, and monasteries. Click here to read the full article on the London show. For more information on the DC exhibition, please click here.